Don't be fooled by the name. 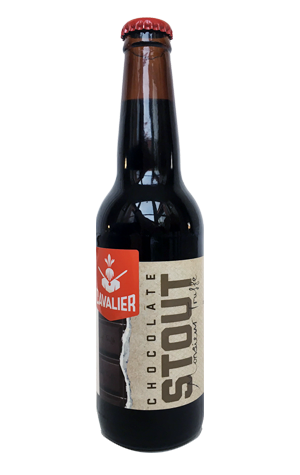 This may claim to be a chocolate stout with no mention of the word "imperial" but it weighs in at the same 8 percent ABV as Cavalier's annual imperial stout. The label does makes mention of two other crucial elements, however: Monsieur Truffe and East Elevation Cafe, with the Melbourne pair providing slow roasted Organic Fairtrade Ecuadorian Arriba Nacional cacao beans for the brewers to add to the beer. The additions don't take the beer too far from straight imperial stout territory yet it is a quite different beast to Cavalier's staple. We picked up molasses/liquorice/figgy dark fruit characters amid its sticky body as well as some liqueur like booziness. It's one for the sweeter toothed dark beer fans too with that booziness complemented by treacly chocolate and sweet espresso flavours.